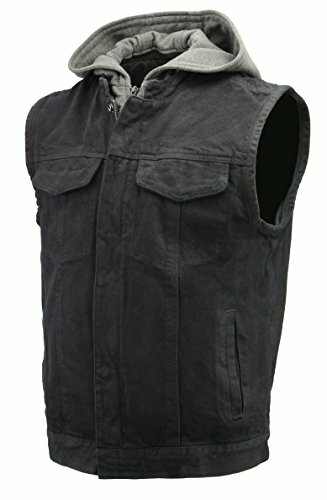 This thoughtfully crafted men's biker club style denim vest is made for style, comfort, quality, and convenience. The 100% cotton denim simultaneously achieves a relaxed fit and long-lasting durability. There are two gun pockets inside, two snap-button chest pockets, and two lower hand pockets. The single panel back enables simple installment of the user's special patches while the snap and zipper front closures ensure maximum security. 100% COTTON DENIM: this material achieves a relaxed, comfortable fit while maintaining its strength and durability to resist damage and stretching over the years (14.5 oz). REMOVABLE HOODIE: this hoodie can be added or removed as the weather changes. Enjoy personalizing your look and maintaining your comfort! CONCEALED GUN POCKETS: there are two built-in gun pockets on the inside for bullets and weapons. OTHER POCKETS include two snap-button chest pockets and two lower hand pockets. SINGLE PANEL BACK: this feature is ideal for anyone who would like to unify their club with their signature patch or simply customize their vest with their personal selection of patches. ADDITIONAL FEATURES: the front closure consists of concealed snaps with a hidden zipper underneath for maximum security. ------- For your SIZE, refer to the sizing chart on the last picture following the series of product images. Please carefully review this table to ensure proper fit and to avoid the hassle of exchanging your new denim biker vest. If you have any questions about this product by The Bikers Zone, contact us by completing and submitting the form below. If you are looking for a specif part number, please include it with your message.